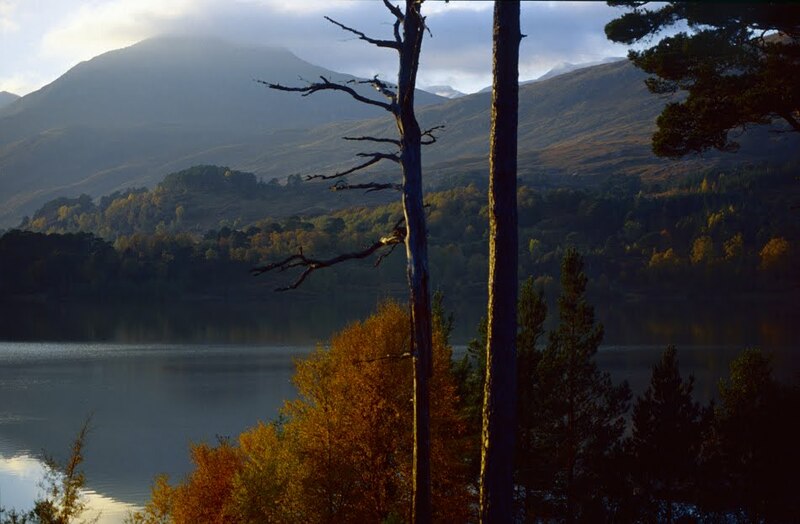 This is the time of year for a short break in one of Scotland's 'fall country' areas. The name the tourist agency gives this behaviour is an 'autumn gold mini break' - and while this might be a piece of boak-inducing marketing speak, it is a fairly accurate description of the sort of thing that people, like me, like to do. Ever since reading Louis Stott's excellent book The Waterfalls of Scotland I've been alive to the possibilities that this time of year provides. Trees and waterfalls never look better than in autumn, so when the weather is good, why not pop off to Perthshire, Speyside, Deeside, Glen Affric or the Trossachs? The Falls of Feugh were new to me, but recommended by a friend as part of a larger day. There is a small car park and toilet at Bridge of Feugh on the outskirts of Banchory, and although fairly quiet when we visited, it is obviously a popular tourist spot. Many waterfalls popular with the Victorians are neglected these days, but not the Falls of Feugh. Being accessible by a 50 yard walk from the car just 18 miles from Aberdeen is probably one of the main reasons for this. No Eas Coul Aulin style long walk in at the Falls of Feugh. The attractive fall runs directly under a footbridge, providing grandstand views with a minimum of effort. We were keen to see salmon leaping but, either because we were just a few weeks too late in the season, or because of the volume of water in the fall, we saw just one or two poor fish, attempting to slide up the torrent to no avail. A heron flew away on our approach and settled at the top of the falls, but even it would struggle to land the dark, yard-long shape we glimpsed thrashing about in the white water. Visiting the falls is not enough on a fine day, and we walked on further for Scolty Hill. This modest height, surrounded by forest with an extensive heather muir on top, has a tower on top that can be climbed. It provides views across lower Deeside, to Morven, Clachnaben and its tor, down to Banchory in its woods, and away to Lochnagar, streaked with snow, tantalisingly inacessible given the day's schedule. I had always thought the scenery in Deeside did not officially start until Loch Kinord and Morven, another 20 miles upstream. I was wrong. By way of diversion, a film for you from the Littlest Album 4 launch gig in Glasgow's Nice'n'Sleazy last weekend. The Littlest Album is a concept album. Appearing on a vinyl 7" single, it has twelve tracks from twelve different bands, none more than a minute long. But while most bands produce a track no more than a minute long, I wanted to produce a *band* that existed for no more than a minute. I recorded the music and the vocals, made some friends familiar with it, then got them up on stage - with no rehersal - to perform the one minute long track. And then we disbanded, never to be seen again. Glen Affric is often stated to be the finest of Scotland's glens, although this is like claiming that Talisker is the finest malt whisky - heated argument ensues. Many people will prefer Glen Coe, Glen Torridon, Glen Nevis, Glen Feshie or another of Scotland's beautiful glens. What Glen Affric boasts in its thirty mile length though is a variety and spaciousness of scenery that the more obviously spectacular glens like Coe and Torridon lack. It scrubs up well enough, don't you think? My early trips to Glen Affric were all hill bagging expeditions, acessing on foot the wild glens around Sgurr nan Ceathreamhnan from the north, south and west. But from the east Glen Affric can be accessed in part by road, and this is the part that is most famous for its mixed scenery of hill, water and forest. I must confess I had not been this way until I had already bagged all the Munros higher up the glen where it is grander and more bare. But this glen is just one of four similar, car accessible glens whose rivers drain into the River Beauly. Glen Strathfarrar, to the north, shares its qualities of spaciousness and mixed forest/mountain views. Arriving in Glen Affric from Strathglass, there is one obvious low level walk, which is to park the car at the scenic Dog Falls, then walk west along the forest track to the south of Loch Beinn a' Mheadhoin to Loch Affric. You are now far from your car, and can either retrace your steps or walk back along the road. More adventurous types will go further west. Beyond Loch Affric, the glen becomes bare and treeless, passes a couple of mountain huts, and the walker can chose to descend to Kintail via the waterfalls of Glen Licht, or pass under the cliffs of the wonderfully names Gates of Affric. Which would you choose? 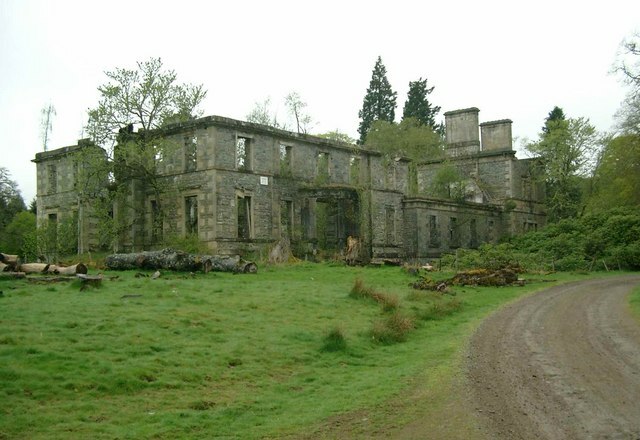 This used to be sporting estate country, Victorian and Edwardian industrialists playing at Highland lairds in an emptied landscape, tresspassing discouraged. Times have changed, and today, curious walkers on the way to Plodda Falls wander around the ruins of play-homes like Guibhsachan. My favourite time for a backpacking expedition to Glen Affric is early summer, late snows wreathing the tops and the black river skin-quenching to bathe in. The wide, wild, empty heads of the glens emptying into the Beauly are a world away from their well-wooded roadsides. This is, I think, the best area in Scotland to come backpacking for several days and see next to nobody. But I should leave that for another post, perhaps? There can be little doubt as to the most scenic of Britain’s four corners. 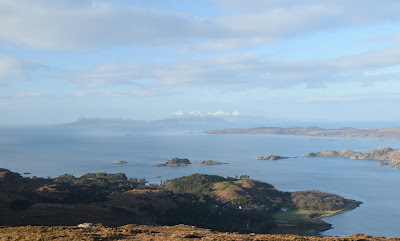 With islands like Rum, Eigg, Mull, Skye, Barra and Coll on three sides of the peninsula, Ardnamurchan feels less like the end of the land, more a springboard to the islands. Cliff-girt to the south, Ardnamurchan Point boasts a beautiful machair beach to the north, all on the site of a long extinct and eroded volcano, viewable from space. 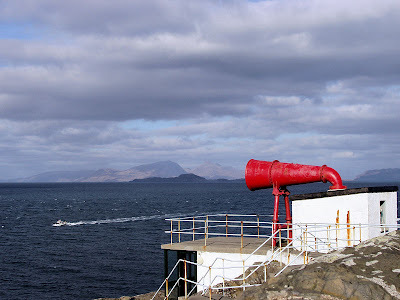 I have always looked on the ferry that crosses the Narrows of the Linnhe Loch at Corran as a kind of mobile decompression chamber, where various kinds of pollution were drained from the blood and I was fitted to breathe pure air again. The south of England is the misanthrope's perfect holiday destination. The reason is not wilderness, but the opposite. Being the most densely populated area in Europe, people have had to develop strategies to deal with proximity. This manifests itself in politely ignoring the people around you. Thus you can be happily lost in an English crowd, when in a similar situation in Glasgow or Ireland you would not be left unmolested, asked about your family, etc. But Cornwall is different: beyond the south and in the west. 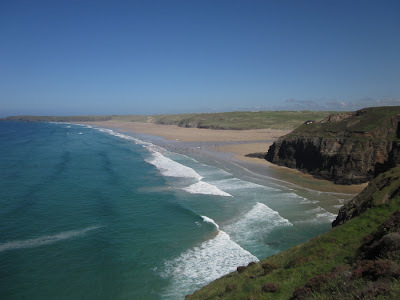 And despite the incredible number of tourists – 25 million visitor nights a year, in an area the size of Galloway – the south-west coastal path is largely quiet. 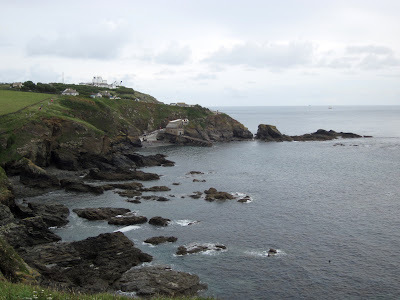 The Lizard is one of the main attractions on the coast, but even here, you only need to walk a mile and the crowds disperse. The southernmost point of Britain is an archetypal place, low seacliffs crowned by rough grazing and a white lighthouse. It could be almost any headland along the coast. But the rocks offshore are the southernmost save Scilly: and if you were to head directly south from here, you would miss Brittany and land on the Asturian coast. 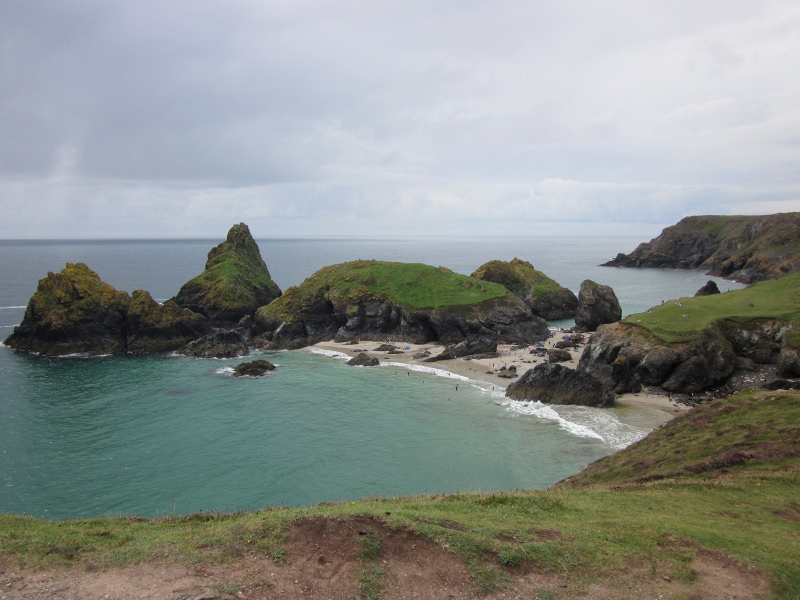 Instead, we headed northwest, towards Mullion via the picturesque Kynance Cove.